The teachers at UCT English Language Centre are all highly qualified and experienced in the field of EFL (English as a Foreign Language). Each one has their own specific area of expertise and interest which contributes to the development of our team and ensures that ELC delivers on its promise of teaching at the highest standards of English. In addition, ELC runs accredited, high quality TEFL courses (Teaching English as a Foreign language) which offers aspiring English teachers a chance to learn from the best. These courses are designed, run and facilitated by ELC trainers. When not providing training, TEFL trainers form an integral part of the ELC English teaching team, as well as providing regular CPD (continuous professional development) to ensure all English teachers at ELC maintain high standards. 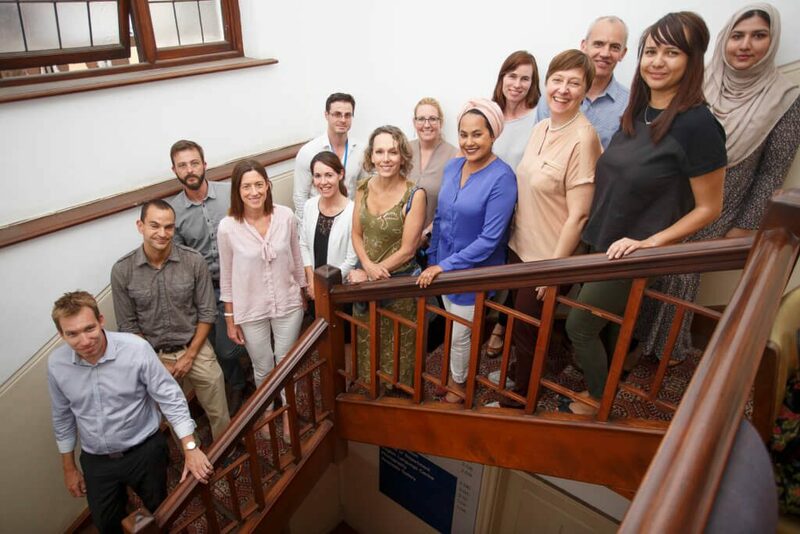 The staff members are committed to ensuring your experience, from the moment you enquire to study with us, until the day you graduate from our school, is a positive one. Between them, teachers and staff have worked and taught all over the world and all speak at least one additional language to English. This means that not only do we understand the challenges in learning a foreign language first hand, but we are sure someone in the team can assist students if they get stuck with any issues here in Cape Town. 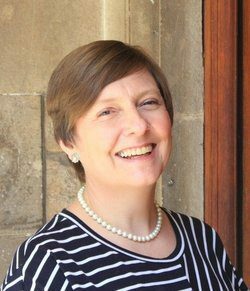 Director and Head of Unit MA, DELTA, BA (Hons), CELTA Areas of interest: Systems of collocation; prosodic features of speech; IELTS training; business development in ELT. 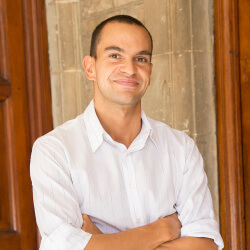 Simon has worked in ELT for 15 years in the UK, Spain and Brazil, before joining UCT in 2014. 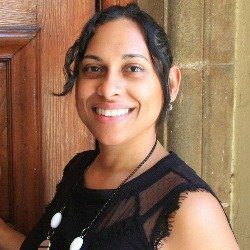 Director of Studies MA, BA, CELTA Areas of interest: Monica is very passionate about education, not only English Language Teaching, but all areas of education, especially alternative progressive models. She also has a keen interest in teacher development. 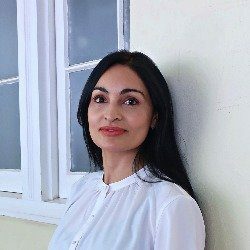 Monica has about 15 years’ experience in the EFL industry, having worked as a teacher at a number of schools in Cape Town, and done a bit of teacher-training, IELTS & Cambridge ESOL examining as well as working in Academic Management. Teacher, Assistant Director of Studies, TEFLTrainer BA (Hons), Delta, CELTA Areas of interest: Motivation in ELT; metacognitive learning strategies; lexical retention and recall. 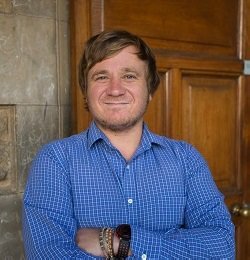 Since training in Oxford, Alex has worked in a range of teaching, teacher training and ELT management positions in Cape Town and the UK. Teacher & Accommodation Officer BSocSc (Hons), TEFL Areas of Interest: English for Academic Purposes; Digital Story Telling as a tool for teaching and learning in ELT. 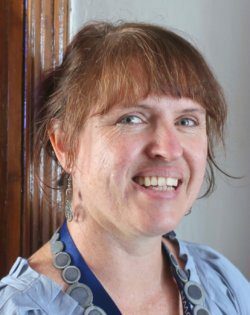 Catherine has worked in Adult Basic Education and Training (ABET) and EFL since 2003 in South Africa and Spain. She ran EFL, EAP and TEFL courses at the Cape Peninsula University of Technology (CPUT) before joining ELC. Teacher, TEFL Trainer and Social Media Manager BA, DELTA, Trinity CertTESOL Areas of interest: Discourse in written production; lexical systems; developing learner autonomy. Christelle moved from a career in chartered insurance into ELT in 2012. 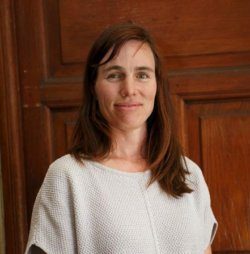 She has taught in London, Manchester and Cape Town, joining ELC in 2015. TEFL / TESOL Manager MA TESOL, Dip TESOL, Delta, Cert TEFL Areas of interest: Teacher training; teacher coaching; experiential learning; time limit anxiety in Language Learning. 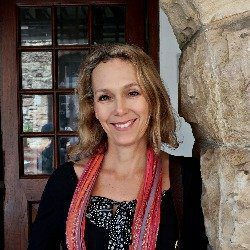 Juliette worked in ELT for over 20 years as a teacher and teacher trainer in private language schools, Helderberg College and the University of Stellenbosch. She joined ELC in 2015 as Director of Studies and is now focussing her attention on developing the teacher training portfolio. Mobile-Assisted Language Learning; Adult/ Higher Education; Teacher-Training; EAP. 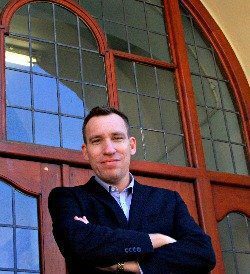 Warren has worked extensively in South Africa and the Middle East during his career. He is currently working on his doctorate in Education at UCT. Teacher BA, TESOL and TEYLT Areas of interest: Sociocultural representations of English in an EFL context, academic and social literacies, interactive learner-focused lessons through constant engagement. Aqeelah has worked in Riyadh, Saudi Arabia where she taught at the world's largest female university. 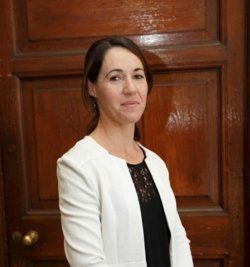 She was involved in personal development for teachers held by Cambridge university, as well as other academic developmental programmes for both students and teachers. She has also worked locally at a language school. 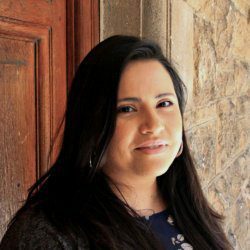 Teacher MA (current), B. Sc (Honours), CELTA Areas of interest: Culture in the language classroom. Il-haam has worked in a variety of language schools and University Preparatory Schools in Cape Town and Istanbul. 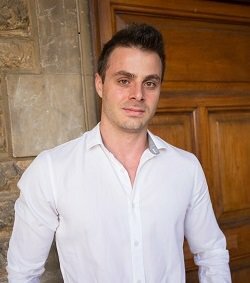 After living with his family in the Middle-East for years, Luke returned to South Africa to study and now calls Cape Town ‘home’. He has worked as a corporate comic-book writer, business textbook editor and online English teacher before finding his feet as an EFL teacher. Teacher BA, TEFL, Performers Diploma in Speech and Drama Areas of interest: using improvisation and role play in the language classroom, transformation from passive to active vocabulary, as well as exam preparation. Nicole has been teaching for 20 years in South Africa, Russia and Taiwan. She is also a professional actress, game show host and writer. Senior Secretary BCom Accounting (current) Areas of interest: Skills development for all levels of learners. Kirsten worked for a Skills Development training company before recently joining the ELC team as their senior secretary. She assists with the day to day running of the office / front desk. Social Programme Coordinator BA (current) The social programme coordinator is responsible for arranging weekly activities for students. Teacher BA, TESOL, TEYLT, TEFL, MA TESOL (current) Areas of interest: Promoting 21st century skills, developing learner intercultural competence, and integrating technology and language learning. 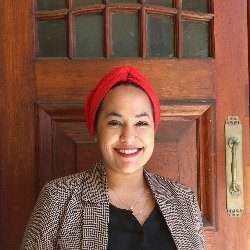 Fatima describes herself as an eternal learner and always aims at improving herself professionally. She completed an additonal TEFL course at Europass, Italy and recently attended the Oxford Teachers Academy Summer Programme at the University of Oxford. 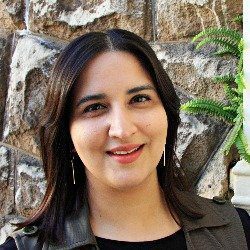 She has worked at the British Council in Cape Town as an Exams Officer and have taught at language schools in Cape Town. 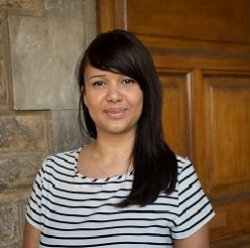 Samantha has taught in general schools for over fifteen years, teaching both primary and senior students, through English, in South Africa. she has taught at an International school teacher in Angola and Bangladesh. At a bilingual school in Cambodia, she was the principal and director. Teacher BA, PGCE, TKT, TESOL, Public Relations Certificate, DipTESOL (current) Areas of interest: How to generate own materials and resources from scratch, creating a conducive classroom environment for the learners and role playing as a mean to practise language learnt in a communicative activity. Annaëlle has been in the education field since 2007. She has had the wonderful opportunity to work as a high school teacher, ESL teacher as well as a manager. 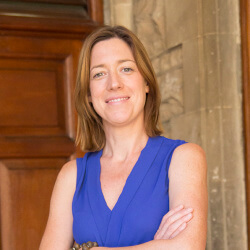 Annaëlle loves teaching and interacting with her students and colleagues. Teacher BA, DELTA, CELTA Areas of Interest: Allowing student-generated language to fuel the content and trajectory of the lessons. Material-light lessons focusing on student output. Teacher Training. Charnel has taught in various language schools around Cape Town and abroad for the last 12 years. She also teaches online. Teacher BComm(Hon), TESOL, TEYLT Areas of interest: Developing learner autonomy, use of technology and media in the classroom, and making meaning clear to lower levels. 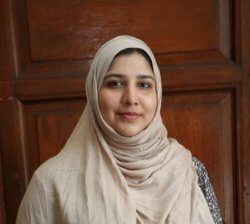 Qanitah's interest in EFL started in 2014, but her passion for teaching started years before that when she served as a tutor at school and university. 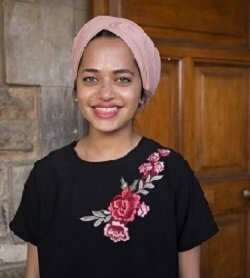 Qanitah has has taught in South Korea where she gained two years experience, as well as in South Africa at various language schools. 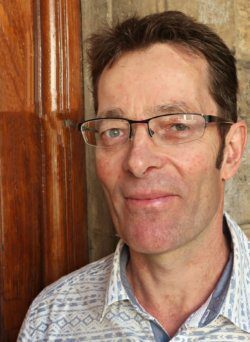 Teacher BA & Higher Diploma in Education, CELTA Areas of interest: Mike is generally interested in education and training and different approaches to teaching and learning. His years in small business have given him a focus in language in the workplace. This includes English for business strategy, marketing, human resources and psychology. Mike has taught in schools for 5 years an din the TEFL / ESOL industry for 3 years. He has also worked in small business for more than 10 years.